I was actually kinda sad with the fact that I didn't get my swatches with Vanessa :(. We usually go together everytime MAC has a new released collection, but she had some business to take care of after work. So, I went right after work... by myself. It was definitely weird and not so much fun. Anyway, I didn't get to swatch the Gold Fever collection because apparently my Nordies didn't have them out yet. The new Suite Array collection didn't really grab my attention at all. The eyeshadow combination actually reminds me of NARS except when it comes to the quality of the MAC eyeshadows, they are more matte, chalky, and sheer. It's really hard to pick the color from the pan, and once it's applied it's more glittery than it is pigmented. I needed to really put some pressure onto my fingers for just the eyeshadow to show up. They just didn't strike me as worth it. The Pearlglide eyeliners however have nice pigmentation. Although, they're creamy in a sense that it will budge if you try rubbing it off, yet it's hard to take off (if that made any sense) that soap and water won't just cut it. These eyeliners are almost like the Urban Decay 24/7 eyeliners in my opinion. So what do you think for MAC's 293274x collection? Was it strikingly beautiful enough for you? Or is it a complete miss? its kind of a hard color to wear for me so its hard to find the right shade. man im probably gonna get that one for sure! Luckily i work in the mall and tomorrow is pay day. sadly, im broke so i have to go from the mall, to the bank and BACK to the mall to get what i want at nordies. 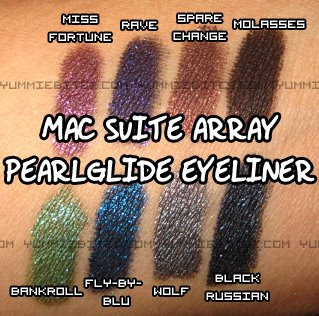 the pearlglide eyeliners look pretty :) how much do they cost? that is soooo strikingly beautiful indeed!!! i like the eyeliners better tho. The Pearlglide liners look check out worthy! I think I can skip out on the lipsticks of Creamsheen. Thanks for the swatches!! I like knowing what I like before I go in the store, lol! The liners are pretty! "Ok, hold back Lynne... quit adding and start using", lol! Aww, that's disappointing. I was looking forward to the eyeshadows because the colors look so pretty! Damn MAC for being so inconsistent with the pigmentation and chalkiness of their e/s! On the other hand, the liners look gorg. Another vote for the Pearglide eyeliners. I'm already loving the Fly-By-Blu and Rave. wow very pigmented colors! fly-by-blu is soooo pretty!!! The liners are gorgeous! It's a shame about the eyeshadows, I was so looking forward to them. the shadows don't seem to amaze me but oh yes, the pencils do! Thanks for sharing. oooooo, i must have the eyeliner pencils. 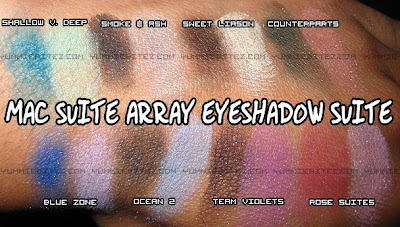 Yeah even from the swatches the eyeshadow duos look chalky =T. Counterparks looks pretty though. The eyeliners look awesome, but the shadows aren't appealing to me as much. Except that I love the packaging! Thanks for the swatches! For some reason, MAC hasn't impressed me lately. I'm saving up some moolah for the upcoming MSF collection though! thank you for the swatches :D they look awesome! !